You are here: Home » How the Australian Federal Police and Federal Courts collude to sweep criminal conduct of judges under the carpet. Part one. If you want to make a complaint of criminal conduct against a judge where do you go? Nowhere apparently or that is the only conclusion that you can come to based on correspondence from the Australian Federal Police and the courts. As the emails and document below show, if you go to the Federal Police they say go back to the Chief Justice of the court and the courts say go to the police. Your basically left in no man’s land. The documents below show this in full flight. What it means is that judges and magistrates are basically untouchable. I deliberately do not get into too much detail of the complaints set out below as it would take at least some, if not a lot, of the focus off the key point of this post and that is the police in collusion with the courts refusing to investigate serious allegations against judicial officers. This is not some minor mistake or oversight by the police or courts and their tactic is not a new one but an old one. By pointing the finger at each other for responsibility they are giving the complainants the run around until they lose heart and drop off with the complaints. This is consistent with my previous posts “The Canberra Mafia. How and why the Australian Federal Government conceal corruption” and “Pigs On The Run – The Australian Federal Police” where the Federal Police get mentioned by John McMillan, the former Commonwealth Ombudsman about their failings. The below emails are between Richard Partington and the Australian Federal Police starting January 2011. He complained about a judge, a court registrar and a lawyer. The lawyer has since gone missing and no one knows where she now is including the law firm she worked at and the law society. And the court registrar was made a judge not long after Mr Partington’s complaint. 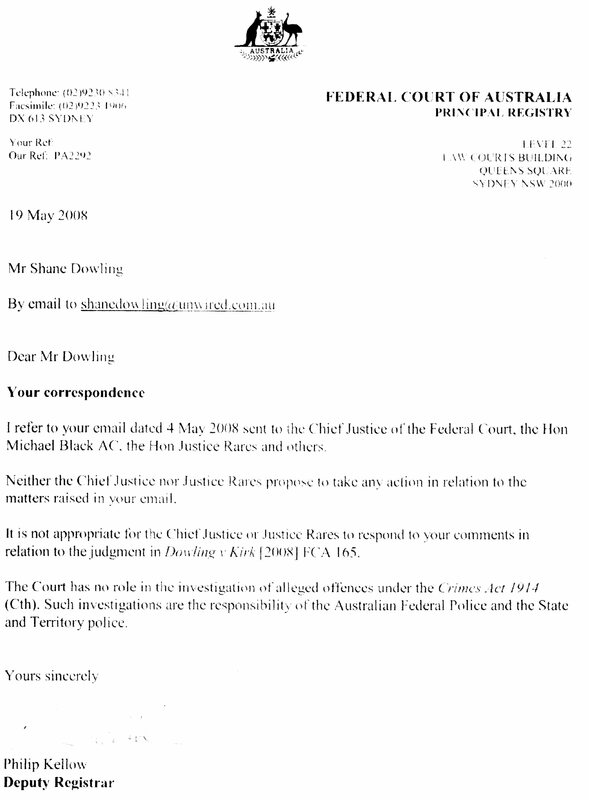 Then there is a letter below that is a response that I received from the courts in 2008 in relation to a complaint about the criminal conduct of Justice Steven Rares of the Federal Court of Australia. When you put the two pieces of correspondence together what it shows is that the Australian Federal Police say they cannot investigate criminal conduct by judges unless the Chief Justice of the court says so. And the Chief Justice says the opposite. I have highlighted in bold two of the key parts below. We have been advised that you are seeking an update in relation any action taken by the Australian Federal Police (AFP) regarding your enquiry dated 17 January 2011. Please note the below correspondence from the AFP sent to your email address (Richard7632@hotmail.com) dated 18 January 2011, noting that your enquiry is not a matter for the AFP to action and the most appropriate course of action would be for you to refer your complaint to either the Family Court or the Federal Magistrates Court. The AFP has noted your enquiry and you may provide Case Note Entry 150151557 as your reference number. As previously mentioned the AFP will not be investigating your complaint and the enquiry has been finalised. Thank you for your email dated 17 January 2011. The Australian Federal Police (AFP) investigates crimes against the Commonwealth of Australia or crimes with a Commonwealth interest. The Chief Justice of the Family Court and the Chief Federal Magistrate of the Federal Magistrates Court are responsible for overseeing the management of complaints about the judicial work of the courts. You may make a complaint to the Chief Justice or the Chief Federal Magistrate if you are unhappy with the conduct of a judicial officer during the course of a hearing or experience an unreasonable delay in the delivery of a judgment. The federal courts are each responsible for their own operation and management, including the handling of complaints. If the Chief Justice or the Chief Federal Magistrate determine that a Commonwealth offence has been committed, then they may refer it to the AFP for investigation. Your complaint has not been referred to the AFP for investigation from the federal court, as such the AFP will not be investigating your complaint. Richard Partington tells me he made a 20 page complaint on the 17th January 2011 and the he never received the so-called response email from the Federal Police on the 18th January 2011. He has checked his email for that date and dates close to it and there is nothing there from the AFP. This is supported by the fact that he called the Federal Police in October this year and they sent an email response. Why would he follow-up with the Federal Police in October if he had received the January email from the Federal Police? He also says that he had several phone conversations with the Federal Police between January and October where they said they were investigating and they even named people they still had to talk to and how they could not find the lawyer etc. But in October he spoke to a Federal Police officer called Craig (who also said they were still investigating) and he asked for a written response stating were the Federal Police were at and what they had done in relation to his complaint. Craig refused to give his last name when asked by Mr Partington even though an AFP appointee has an obligation to give their full name or identification number and work location when you ask. A few days later Mr Partington received the email dated the 17th October 2011 referring him to the email the Federal Police claim they sent him on the 18th January 2011. Since when do the Federal Police respond within one day to a 20 page complaint. They do not even respond to a one page complaint in one day. And it must be remembered their response is a lie. Anyone in this country or even outside this country can make a direct complaint to the Federal Police. They do not need to be referred by someone else, in this case the Federal Police say that only the Chief Justice or Chief Magistrate can make a referral to them in relation to the criminal conduct of a judge or magistrate. It is worth noting that neither emails from the Federal Police had a name on them. Just the generic “Sydney OMC”. This is not the normal way complaints are handled and if the Federal Police are going to say that now it is, it would be deeply disturbing. I refer to your email dated 4 May 2008 to the Chief Justice of the Federal Court, the Hon Michael Black AC, the Hon Justice Rares and others. Neither the Chief Justice or Justice Rares propose to take any further action in relation to the matters raised in your email. It is not appropriate for the Chief Justice or Justice Rares to respond to your comments in relation to the judgement in Dowling v Kirk  FCA 165. The court has no role in the investigation of alleged offences under the Crimes Act 1914 (Cth). Such investigations are the responsibility of the Australian Federal Police and the State and Territory police. I do not get into the details of my complaint against Justice Rares here but it is rock solid, it is an open and shut case. (I detail all the evidence in my book). The fact that neither Chief Justice Black nor Justice Rares refuted my claims above says it all. But the key point I am trying to make about the above letter is that the courts are saying they cannot do anything about the criminal conduct of judges and to go to the police. This is the exact opposite to what the Federal Police told Richard Partington. Richard Partington has made a complaint in relation to the above emails to Federal Agent Josh O’Connor A/Team Leader, Complaints Coordination Team Professional Standards and has received correspondence from Superintendent Ian Houghton from the same division. I will follow this up to see where it goes. I have also sent correspondence to the Attorney General Robert McClelland, Shadow Attorney General Senator George Brandis, SC and the Federal Police asking them to confirm whether or not only the Chief Justice or Chief Magistrate of the courts can make complaints to the Federal Police in relation to judges and magistrates. An independent body to investigate complaints against judicial officers is long over due even more so given that nobody will do anything. There is no such body Federally or any of the States except NSW, which is the Judicial Commission of NSW and even that body lacks credibility and is hardly independent. This is part one and I will do at least one or maybe a couple of follow-up postings on this topic in the near future. There is corruption everywhere, in governments, police forces, business and society in general. But the federal government want us to believe that their no corruption in the judiciary so there is no need to have an independent body to investigate complaints. This website is a news site and has a clear agenda and that is to have something done about corruption in the Australian Judiciary. For that to happen we also need to deal with corruption in the government and police as they are the ones facilitating it. Make sure you sign up for the free “Email Subscription” and about once a week you will get an email when there is a new post/story on this site. At this stage there are 192 subscribers most of whom have joined in the last few months. The target is 500 by the end of the year. Ring your friends and get them to join as well. ← Julia Gillard appoints Bernard Murphy, her partner in crime from Slater and Gordon Lawyers, as a Federal Court of Australia judge. The things that go on in our courts leave most of us with a deep sadness and a desperate feeling of despair and confusion. I had a Federal Court Magistrate deny me shared access with my child because my partner was Asian, discribing her culture as “potentialy harmful to my childs mental development”. This reptile hears matters of racial discrimination in her court. I have been told under the Magistrates Act, this vermin is exempt………. Australia is in decline,you can see it and feel it. Every policy decision,every act,every comment that this Labor Government makes adds to this decline. This Government has an agenda,along with the Greens, of regulation,control and ‘Government knows best’, socialist/communist ideologies. You can feel the ‘undercurrent’ in everything they do and say every decision they make. The attitudes of this Labor party speaks volumes. This Government is deceitful and incompetent and that ‘dynamic’ is flowing strongly through every aspect of Australia, including our judicial system. There’s a lot of work to be done to even begin to address these issues, but first you need to have people in Government that actually have a conscience and these people clearly don’t. Tell me, when is that going to happen??? It will happen when everyone stands up to be counted and they decide enough is enough. Well said Jennifer , i couldn’t agree more . Lets hope websites like this one keep circulating so that our ” freedom of speech ” and the Truth can be told to as many people as possible . Congratulations to the editor of this website for your courage, please keep up your excellent work in shining a light on judicial & political corruption. In all fairness it should be understood that judicial officers and so registrars are protected within the courts sanctity where they are operating within that jurisdiction and as such noi police officer can interfere with what goes on within the sanctity of the court unless so specifically requested to do so by the head of the court, being it Chief Justice, Chief Magistrate, etc. I have actually canvassed this extensively regarding the Linsdell v Vella case where a lawyer Linsdell obtained EX PARTE Intervention Orders in the Magistrates’ Court of Victoria allegedly as to what had transpired during a Supreme Court of Victoria hearing where the judge already dealt with it. There is the seperation of powers that prohibit the Police (for the executive) to interfere with the judiciary unless specifically authorised to do so by the chief of the court. As a CONSTITUTIONALIST I consider this to be essential as otherwise you and I perhaps seeking to flee tyrrany by the police into the sanctuary of a court would be arrested before being able to have the court hear and determine matters. Thik about it! This totally contradicts what you say. The police have the power to investigate criminal conduct no matter where it is. After taking the police to court for a traffic infringement I naively allowed them to change magistrates as the proceeding Magistrate was apparently delayed, I lost the case after the replacement Magistrate threw out the evidence of the police expert witness and ignored my testimony. After the hearing I (unofficially) spoke with the court staff who told me that this Magistrate must have been injured in a car accident when he was young and as such, will never acquit on a traffic matter. This case really opened my eyes to the underhanded tactics used by the WA police and the injustice that can occur from biased magistrates/judges.